Kovalev Ivan Georgievich – neurologist, a graduate student, Research Institute named after VV Zakusov. 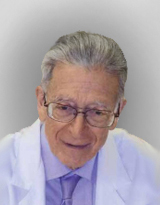 Stepanishhev Igor' L'vovich – MD, neurologist, head of psychoneurology Children's City Clinical Hospital named after ZA Bashlyaeva. Address: ul. Geroev Panfilovcev,Moscow,Russia, 125373. Address: ul. Barrikadnaja, d. 2/1, Moscow, Russia, 125993. Voronina Tat'jana Aleksandrovna – MD, Professor, Honored Scientist, Head of Laboratory of Pharmacology Psychopharmacology. Address: ul. Baltijskaja, 8, Moscow, Russia, 125315. 1. Gusev E.I., Gekht A.B., Khauzer V.A., Mil'chakova L.E., Churilin Yu.Yu. Epidemiology of epilepsy in Russia [Epidemiologiya epilepsii v Rossii (in Russian)]. 2011; 77-84. 2. Mukhin K.Yu., Petrukhin A.S., Mironov M.B. Epileptic syndromes. Diagnosis and Therapy. Reference Guide for physicians [Epilepticheskie sindromy. Diagnostika i terapiya. Spravochnoe rukovodstvo dlya vrachei (in Russian)]. Moscow. 2008. 3. Petrukhin A.S., Mukhin K.Yu., Blagosklonova N.K., Alikhanov A.A. Epileptology childhood [Epileptologiya detskogo vozrasta (in Russian)]. Moscow. 2000; 623 s.
4. Avoli M., Gloor P., Kostopoulos G., Gotman J. An analysis of penicillin-induced generalized spike-and-wave discharges using simultaneous recording of cortical and thalamic single units. J Neurophysiol. 1983; 50: 819-37. 5. Bauer G., Bauer R., Dobesberger J., Unterberger I., Ortler M., Ndayisaba J.P., Trinka E. Departments of Neurology, Medical University Innsbruck, Innsbruck, Austria. J Clin Neurophysiol. 2008 Oct; 25 (5): 250-4 Broad sharp waves-an underrecognized EEG pattern in patients with epileptic seizures. 6. Bancaud J., Talairach J., Geier S., Bonis A., Trottier S., Manrique M. Behavioral manifestations induced by electric stimulation of the anterior cingulate gyrus in man. Rev Neurol (Paris). 1976; 132: 705-24. 7. Chatrian G.E., Bergamini L., Dondey M. et al. A glossary of terms most commonly used by clinical electroencephalographers. EEG Clin Neyrophysiol. 1974; 37: 538-548. 8. Eftekhari S., Mehrabi S. et al. BDNF modifies hippocampal KCC2 and NKCC1 expression in a temporal lobe epilepsy model. Acta Neurobiol Exp. 2014, 74: 276-287. 9. Francis L. McNaughton – report in issue No. Epilepsia. 1966; 1 (7): 80-82. 10. Geiger L.R., Harner R.N. EEG patterns at the time of focal seizure onset. Arch Neurol. 1978; 35: 276-86. 11. Gloor P. Generalized cortico-reticular epilepsies. Some considerations on the pathophysiology of generalized bilaterally synchronous spike and wave discharge. Epilepsia. 1968 Sep; 9 (3): 249-63. 12. Halasz P. Generalized epilepsy with spikewave paroxysms as an epileptic disorder of the function of sleep promotion. Acta Physiol Acad Sci Hung. 1981; 57 (1): 51-86. 13. Liu J.S., Wang J.H., Zhou J., Tang X.H., Xu L., Shen T., Wu X.Y., Hong Z. Enhanced brain delivery of lamotrigine with Pluronic® P123based nanocarrier. International Journal of Nanomedicine. 2014; 9: 3923-3935. 14. Magnus O. Reunion Europeend’information. Marseille. 1-5 September 1970. 15. Magnus O.,Van der Holst M. Zeta waves: a special type of slow delta waves. EEG Clin Neurophysiol. 1987; 67: 140-146. 16. Marcus E.M., Watson C.W., Simon S.A. An experimental model of some varieties of petit mal epilepsy: electrical-behavioral correlations of acute bilateral epileptogenic foci in cerebral cortex. Epilepsia. 1968; 9: 233-248. 17. Meldrum B.S., Rogawski M.A. Molecular Targets for Antiepileptic Drug Development. Neurotherapeutics. 2007 January; 4 (1): 18-61. 18. Noachtar S., Binnie C., Ebersole J. et al. A glossary of terms most commonly used by clinical electro encephalographers and proposal for the report form for the EEG findings. In: Deuschl G., Eisen A., eds. Reccomendations for the Practice of Clinical Neurophysiology: Guidelines of the International Federation of Clinical Neurophysiology. 2nd ed. Amsterdam. 1999: 21-41. 19. Pollen D.A., Perot P., Reid K.H. Experimental bilateral wave and spike from thalamic stimulation in relation to level of arousal. Electroenceph clin Neurophysiol. 1963; 15: 1017-1028. 20. Stefan H., Snead O.C. In: Engel J., Pedley T.A., editors. Epilepsy: a comprehensive textbook. Philadelphia. 1997: 79-590. 21. Timofeev I., Steriade M. Neocortical seizures: initiation, development and cessation. Neuroscience. 2004; 123: 299-336. 22. Williams D.A. Study of thalamic and cortical rhythms in petit mal. Brain. 1953; 76: 50-69.